The values of the EU are put at risk by the lingering conflict in Ukraine, as well as by actions of the NSA, according to an opinion piece written by German Vice-Chancellor Sigmar Gabriel. 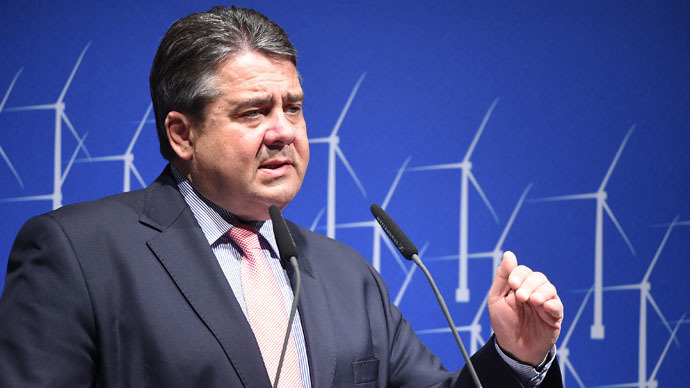 Gabriel, the economy minister and leader of the German Social-Democratic party (SPD) wrote an opinion piece for Bild newspaper, published on Friday. “The EU stands for the values of the West – the individual freedom, democracy and rule-of-law state. These values are threatened. In Ukraine the same way as through the terror of the Islamic State,” wrote Gabriel. Gabriel also speculated on the cooperation in the European Union, saying that “more courage for different speeds” is needed for proper collaboration. On Friday, German Chancellor Angela Merkel and British Prime Minister David Cameron are to hold talks in Berlin to discuss possible EU reform. The UK doesn’t favor the ever increasing powers of Brussels and greater political integration. “The tasks that lie before us are so big, that every country is too small to solve them alone. Even strong Germany. For this reason it's time for Europe to reform,” Gabriel wrote, pointing out that the reform could help the EU get more social and fair. In April, Germany saw another development of the NSA scandal, as Zeit Online revealed that Germany's BND intelligence agency had been sending enormous amounts of phone and text data to the US National Security Agency (NSA) each month – some 1.3 billion pieces monthly – that occurred for a ten-year-long period of time. One third of the society felt deceived by Angela Merkel’s covert policy, regarding the connections between the agencies. Ukraine has been engulfed in internal conflict since last April, after Kiev’s army began a crackdown operation in the eastern regions of Donetsk and Lugansk after they refused to recognize Kiev’s coup-imposed government. The civil conflict has already taken lives of over 6,200 civilian lives, according to the latest UN figures.